A show you dont want to miss! 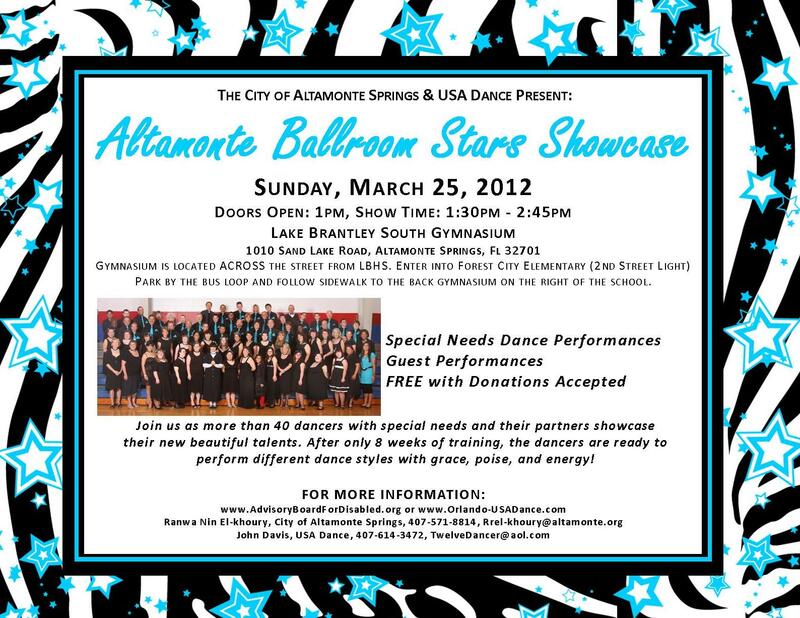 Join us for a beautiful showcase on Sunday, March 25, 2012 as our special needs dancers perform, along with special guest performers. The event is FREE with donations accepted. Gymnasium is located ACROSS the street from LBHS. Enter into Forest City Elementary (2nd Street Light) Park by the bus loop and follow sidewalk to the back gymnasium on the right of the school. The Advisory Board for The Disabled and the Altamonte Christian School will be joining together to host the SPRING SPRINT 5K RUN/WALK at Cranes Roost Park in Altamonte Springs on April 28, 2012. Funds raised will helps support our many programs, including STOP Trips, Nightbird Dances and more! Considering running in this race... along side Fran, or Nin or many others! Click here for details. If you have a special needs participant that would like to cheer on the runners as they cross the finish line, please contact Nin. Thank you to everyone who joined us on Friday, February 24, 2012 for our Spaghetti Dinner at Eastmonte Park. Money raised will help support the Advisory Board for the Disabled, Inc. who financially sponsors many of recreation programs, including STOP Trips, Nightbird Dances and more! If you would still like to contribute, please feel free to send your donation to: The Advisory Board for the Disabled, Inc., 225 Newburyport Ave, Altamonte Springs, Fl 32701. This session of Winter Camp was a fun and exciting time for both campers and volunteers. During the month of February, campers enjoyed a field trip to Circle H Horse Ranch, Aloma Cinema Grill, and Wonderworks. They had a talent show, launched bottle rockets, took a martial arts lesson, ballroom danced with USA Dance. Thank you to all of our volunteer counselors for your time! Visit our facebook page for photos of all the fun! This quarterly publication has details on all of our winter and spring programs. Please remember that the information listed in the newsletter is more current then the calendar. Copies were handed out at the Holiday Gala or mailed to those who did not attend.